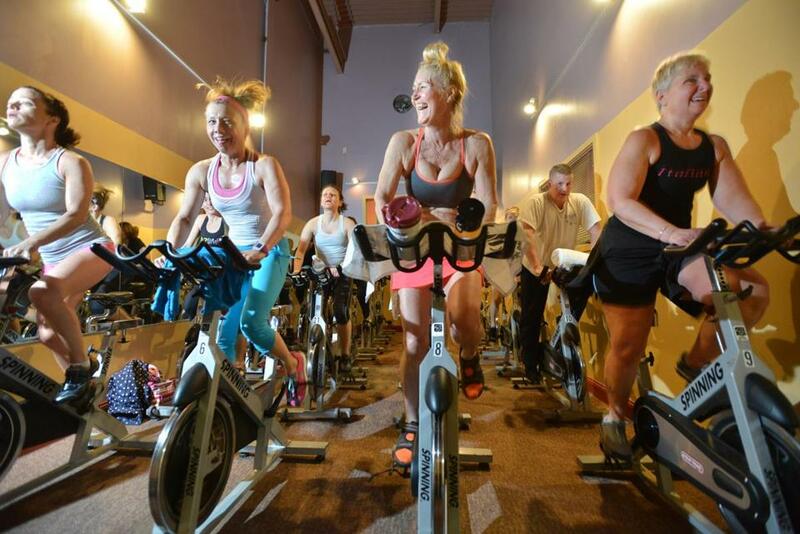 This spin class in Arlington is definitely healthier than sitting at a desk. But what if you could sit at your desk AND pedal? UMass researchers say your productivity wouldn’t suffer. Have you ever used work as a reason not to go to the gym? Well, it might soon be time to think of a new excuse. University of Massachusetts Amherst researchers say office workers might be able to get exercise benefits using a “pedal desk” without any negative effects on their productivity. The researchers found that insulin levels following a test meal were lower when workers used the pedal desk — a desk with bicycle-like pedals under it — compared with those sitting at a standard desk, while work efficiency remained the same. The pilot study, led by Dr. Stuart Chipkin at UMass Amherst’s School of Public Health and Health Sciences, was published in October in the journal Medicine & Science in Sports & Exercise. Pedal desks “could have the potential to achieve public and occupational health goals in sedentary work environments,” Chipkin and colleagues said in a statement. Studies have shown that exercise improves insulin sensitivity. “What was new with this study was the ability to improve insulin response following a meal using a tool (pedal desk) that allows light intensity exercise while performing standard work tasks. And the pedal desk didn’t impair conducting these work tasks,” Chipkin said in an e-mail. Chipkin is an endocrinologist studying the effect of physical activity and medications on insulin sensitivity and skeletal muscle metabolism. Researchers recruited 12 overweight/obese full-time sedentary office workers and tested them in two conditions: pedaling at “self-selected light-intensity pace” for two hours, and working while seated at a conventional desk for two hours, researchers said. Six of the participants were men, and the other six were women. Participants were asked to perform computer-based tasks. They were tested on mouse proficiency, typing speed and accuracy, reading comprehension, and concentration/attention, researchers said. Participants provided blood samples after eating a light meal. Results revealed that active workers using the pedal desk required less insulin to maintain blood sugar levels compared with those using the standard desk. Physical inactivity has been linked to higher rates of obesity, diabetes, and heart disease through insulin resistance and other mechanisms, researchers said. The study emerged after researchers realized that current alternatives for standard desks — standing and treadmill desks — are not ideal for full-time shifts. They said the alternatives may even have some drawbacks, like standing too long. “By contrast, a pedal desk can be used in a seated position at the user’s own pace for as little or as much time as the worker chooses,” researchers said in the statement. In the future, Chipkin said he plans to explore how pedal desks affect people with diabetes. Lucas Carr, an associate professor in the health and human physiology department at the University of Iowa, said it’s important to re-engineer work spaces to allow people to be more active. Carr conducted his own pedal desk study in 2015. It that found that workers who pedaled more were more likely to report weight loss, showed improved concentration at work, and had fewer sick days than co-workers who pedaled less.